The seizures can be fierce, and too often twenty times a day. There are no soft landing spots at a school, compared to a home. Medication can’t be kept with a student in a school, but only in an office. Consider homeschooling! It’s one of your worst nightmares as a parent who wants their child to be successful – Your child with Epilepsy says they can no longer go to school because they have too many seizures while they are there. This situation may seem all too convenient. It may seem like another way to get out of doing homework or get out of having to be up at 6:00am each morning. But in reality, one must think of the many, many legitimate reasons in which a child with Epilepsy should be homeschooled. 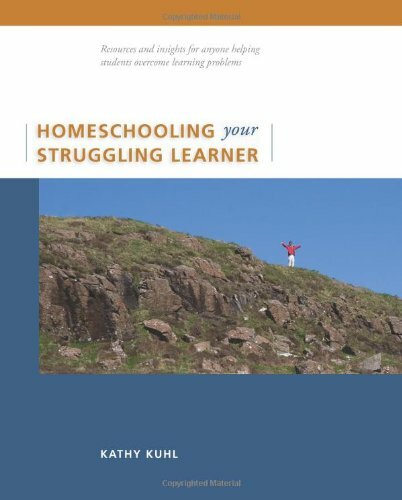 Whether you already homeschool, are considering it, or just want to help your child after school, Homeschooling Your Struggling Learner helps you teach your child at home. Kathy Kuhl homeschooled her struggling learner for 4th-12th grades. After he graduated, she interviewed 64 homeschoolers with children with different learning problems, including autism, learning disabilities, AD/HD, and other conditions. She distills their wisdom while conveying her own experience and insights. See www.learndifferently.com “Her scope of knowledge, sensitivity to the questions and needs of parents…, and list of resources are invaluable to any parent who homeschools their child.” Larry B. Silver, M.D. “Anyone who lives or works with a struggling learner will find many a valuable nugget to aid in their work with these children.” Barbara D. Ingersoll, Ph.D. “Kathy’s experience, wisdom, and knowledgeable advice will be of immeasurable assistance and comfort for you.” Richard D. Lavoie, M.Ed., M.A. I yearn to drive and “get on with life”. Driving is not how I am going to do it. I will wait for my state’s required period of time to pass. My doctor’s letter of assurance. Most of all I will wait until I am sure that I am ready to drive again. I take personal responsibility of my driving privileges. I hope you will too. Hunter is scheduled for his pupil appraisal evaluation in January, and I’m trying to get as informed as possible before then so that I can make the decision whether to go through with the IEP approach they intend to use, or to homeschool. Bringing Awareness to my world and many others. To help others understand there are more to seizures than falling and jerking. A Pinterest board. Hi Parents! let’s talk about homeschooling our children with epilepsy. How many of you do this and why? Homeschooling with Epilepsy – beating the odds! Fiona’s son Connal is 22 and didn’t think he would make it to further education. At primary school teachers were slow to recognise his potential, and he had problems with memory and concentration. She describes how homeschooling provided an education tailored to Connal’s needs and has enabled him to start a new course at college, despite living with uncontrolled epilepsy. God knew just what His plans were for me as a Momma of children with Epilepsy. He planned ahead, allowing me to Homeschool. He blessed me with great children who love and listen and help each other along with Momma when she needs it. He prepared us with a way to bond unlike any other and a way to learn that brings us even closer together.